Needless to say, SPOILERS (for this and previous issues). If you aren’t reading the single issues, and waiting for the trades, it’s probably not a good idea to read on. Nice cover. That’s a good start. The story itself has a little zombie action to whet the appetite, and then there is no further zombie action for the rest of the issue. Just a little tease. We have a supply run, that is partially successful, but there has been some emphasis lately on the fact that food is in short supply, that tinned food may not last forever, that other solutions may need to be formulated. Farming, the very thing that made us rise above our primitive nature and forge civilizations in the past, is proposed as a way forward. I like the fact that there is a real tension over the dwindling supply of food. It has been gradually introduced as an issue, and now it seems to pose as great a threat as the undead. There are hints that the community is currently existing on a diet of very little. This adds to the fractiousness between individuals that has been seen recently. In terms of the visual representation of this, and its effect on individuals, there is little evidence. 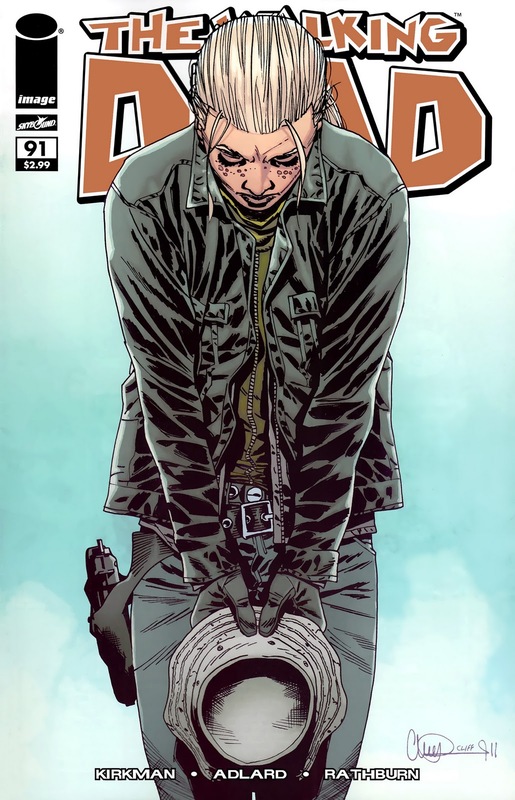 Adlard is still drawing people with the same build as they have had since whatever issue they debuted. Even Eugene still seems well fed. The lack of supplies also throws up the odd little conspiracy. There is one involving a bottle whiskey that is nicely played. It shows humanity with honesty. I think its my favourite scene in this issue. There is a lot of focus on the children, Carl and Sophia. Sophia is still childlike, vulnerable and sweet, having to pretend to herself that Maggie & Glenn are her real parents in an effort to preserve her sanity, it would seem. Carl, on the other hand, is a realist, embittered by his experiences, and now openly challenging his Father. With more emphasis on the anger in Carl, I almost forgot that he should be DEAD, and by the next issue, I may even welcome the fact he is still around. Sophia, in all probability will die soon. Carl will live forever. Now, do you want to know what happens between those star crossed lovers, Rick & Andrea? Well, it seems that Rick has realised the unpalatable truth that anyone he loves usually ends up dead, so he advises Andrea to back off, in an interesting spin on the ‘it’s not you, it’s me’ speech that signals the end of a relationship. Andrea deals with this by talking to Dale’s hat. Just when I thought I was going to put down this issue in disgust at the recycling of the Rick / Phone / Hotline to dead Lori plot device, Kirkman pulls me back from the brink with a very neat pay off. It even raised a chuckle. Sometimes the tedium of this title being set in the community over the last few months has really made me wonder if I want to carry on reading it. This issue just about started to make me see that, in the grand scheme of things, this period is a period of rebuilding. Not only that, it’s a time for Kirkman to lay down plots for when the next shitstorm hits. Dwindling supplies, a community divided, a potential battle for the leadership, a son railing against his Father, spurned lovers. It is all in the mix. Add to that a new plot development on the final page, and the next few issues promise to be interesting, and maybe even a little exciting. 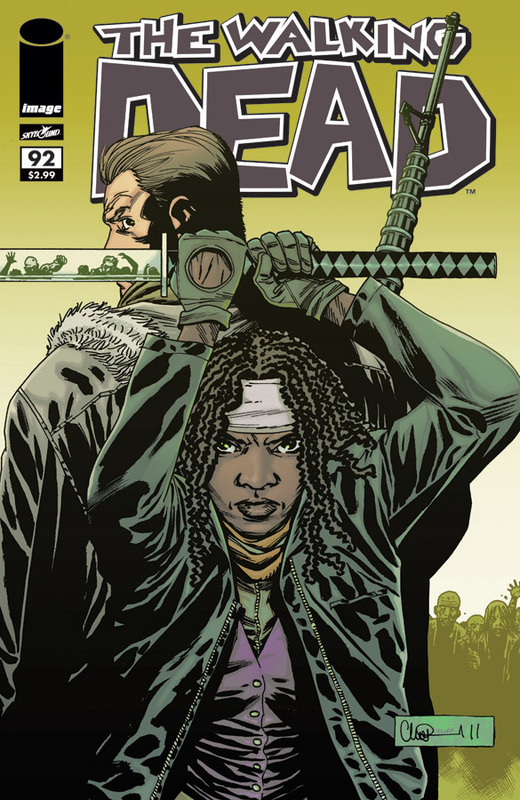 I mean, check out this cover for issue 92, and how can you not get excited?